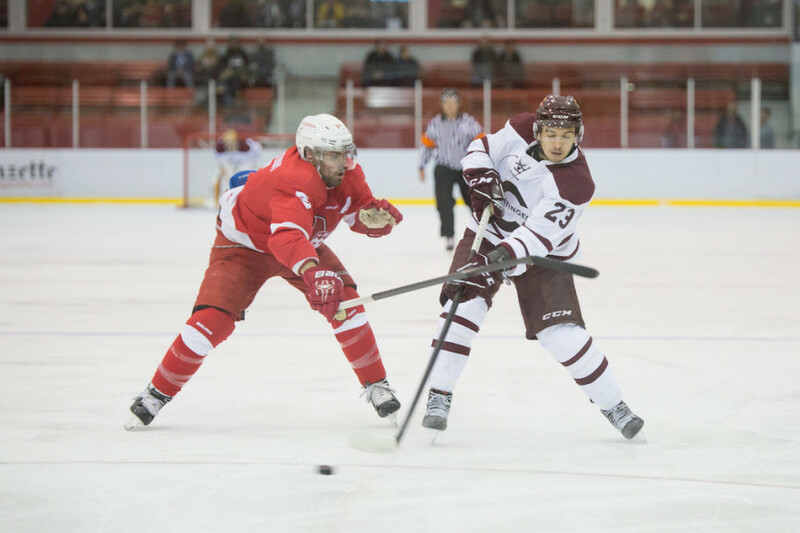 Going up against their rival, the fifth ranked team in the nation McGill Redmen, the Concordia Stingers men’s hockey team started the season with an opportunity to prove that they could overcome the loss of two star players in the offseason. Coming away with a hard fought 3-2 win certainly did that. “What we did is make a statement today and I’m really proud of the guys,” said the game’s first star, Stingers’ goalie Marc-Antoine Turcotte. That statement certainly didn’t come at the start of the game. 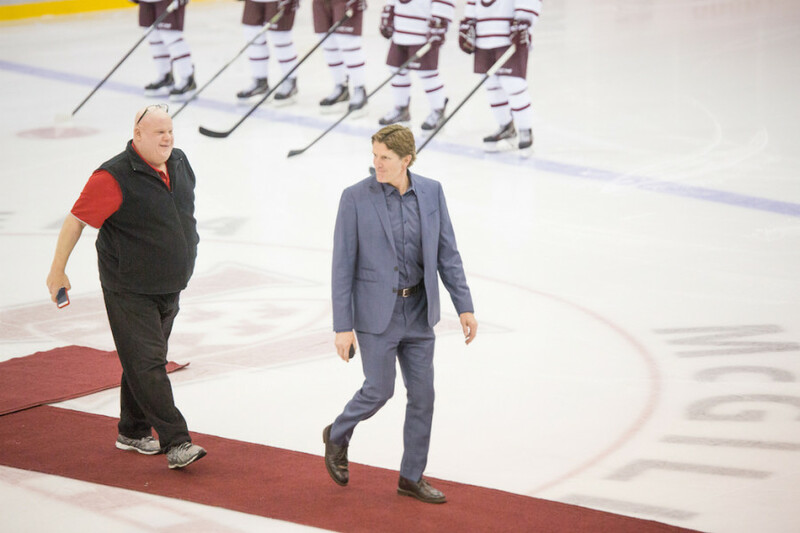 After Redmen alumnus and Toronto Maple Leafs head coach, Mike Babcock, dropped the puck for a ceremonial face-off, it was apparent that McGill had already played two games this season. The Stingers, however, were still finding their legs. Despite some scoring chances, Concordia spent much of the first ten minutes hemmed in their own zone before McGill defenseman Dominic Talbot-Tassi put his team ahead by one. The bright spot of the Stingers’ first period came in the form of rookie talent. McGill alumnus and Toronto Maple Leafs head coach Mike Babcock dropped the ceremonial face-off. Photo Daren Zomerman. Defenseman Carl Neill showed himself to be one of the best players on the ice all night. The first-year player frustrated the Redmen offense in his own zone and moved the puck seamlessly through the neutral zone to set up scoring chances. Fellow newcomers, forwards Massimo Carozza and Alexis Pepin gave the Stingers surges of momentum with speed and a solid forecheck as well. As the Stingers found their stride, forward Scott Oke took a shot from the top of the right circle and tied the game in the dying minutes of the first period. The tie score was short lived as the Redmen rallied at the start of the second period to score their second of them game. Despite this, the Stingers came to life in the second. Their play improved as the game progressed and it showed. “I felt the game more easily as the game went on. It was my first game in awhile so I was nervous at first,” admitted Turcotte who turned aside 39 of the 41 shots he faced, posting .951 save percentage. Penalties were a major theme of the night with 15 minors called in total. It was on a slashing call that Concordia finally took advantage of one. Neill earned his first point as a Stinger, setting up Alexis Pepin’s game tying goal in front of the net. 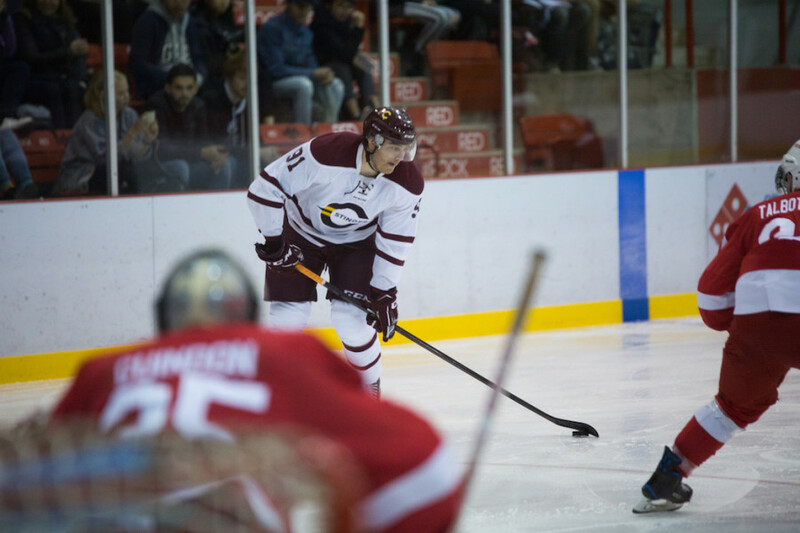 Concordia’s Alexandre Gosselin (right) making his way towards the net. Photo Daren Zomerman. The Stingers were buzzing from that point on and were rewarded when Pepin earned his second point of the night, setting up a two on one for Carozza who evaded one opponent before sending the puck to Stingers forward Charles-Eric Legare for the game winner. The busiest people in the third period were Turcotte and the referees as the teams managed a collective nine penalties in the final frame. 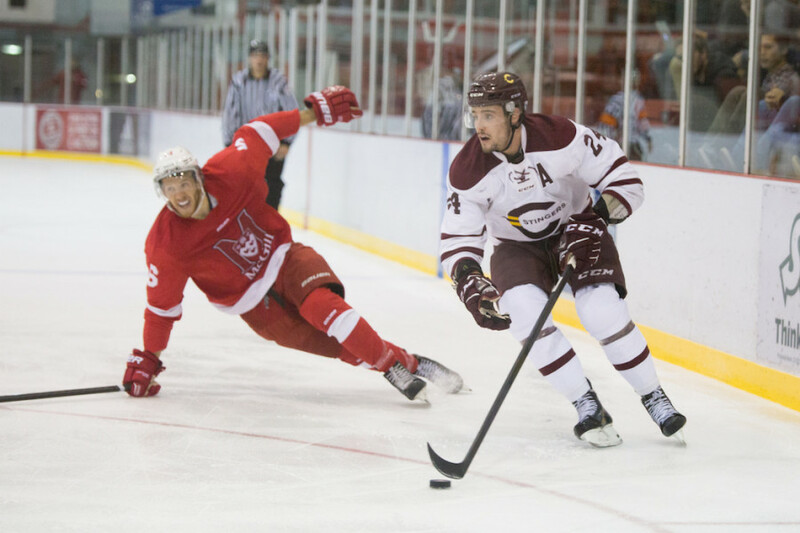 The most important of which came when Stingers captain Philippe Hudon took a double minor for spearing in the offensive zone with just under five minutes to play. What made it even more dangerous for the Stingers was that just over a minute later, Anthony Gingras went off as well, leaving them in a long five-on-three situation. Concordia’s penalty kill stood strong, going seven for seven on the night and Turcotte was wall in the third when the team was outshot 15-4. “I didn’t like having a five-on-three at the end of the game but we’re young, we’re going to learn. It’s two points that we’re really happy we have,” said Element after the game. Despite penalty issues, the team came away with a hard fought win over a strong rival. To Element, the team’s work ethic earned them a win they can be proud of to start the season. “We’re going to be a hard working team and we proved it tonight,” he said.